The STEP parenting program is an effective, seven-session planned training curriculum that focuses on topics important to parents today. This course provides valuable tools which improve communication among family members and lessens conflict. 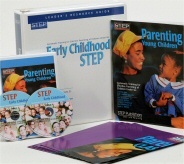 Easy to understand and apply, STEP presents effective skills that can be used immediately. Dynamic video vignettes let parents see how easy it is to put STEP to work in the home everyday! For parents of school-age children - ages 6 through 12. 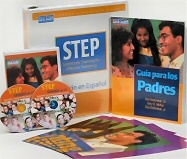 STEPпїЅs handbook for parents includes essential topics such as single parents, stepfamilies, cooperation in the family, schoolwork and homework, drugs, violence, and gangs. STEP is easy to use with chapter openers that relate the contents to real-life situations. Also included are at-home activities that help parents apply STEP ideas and an index to locate topics easily. Supplemental activities for additional practice and discussion. Parent survey and evaluation form that can be used as a pretest and posttest to provide a way to measure the effectiveness of your group, based on parentsпїЅ comments. ParentпїЅs Handbook-easy-to-read handbook for parents. Order copies for each participant. Also available on audiocassette. LeaderпїЅs Resource Guide-with session guide, reproducible handouts, activities, parent survey, certificate of participation as well as additional aids on specific topics important to todayпїЅs parents. 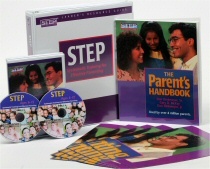 One DVD - models STEP skills parents can use right away, and includes segments for parent educators filled with tips on how to lead a parenting group. Closed captioned. Copyright 2013 © Glazebrook and Associates. All rights reserved.